Unbelievable bay front home with elevator. Open concept living with gourmet kitchen, granite, gas range, wine fridge, SS appliances and peninsula for casual dining. The greatroom and dining area are enhanced with H/W floors, gas FP and lots of windows to enjoy the water views. A half bath rounds off the first level. 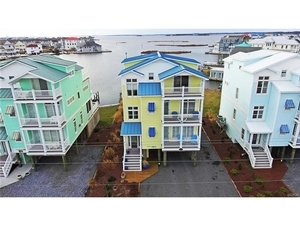 The second floor contains 3 waterfront bedrooms and 2 baths plus the laundry area. The top floor is all yours - a spacious master bedroom with water views all around. The ensuite bath features a shower, dual sinks and jetted tub with fabulous views. Enjoy your morning coffee while lounging on your private bayfront deck. Outside you'll enjoy the multiple decks, huge landscaped grassy yard that leads to your private pier/dock with boat lift and floating kayak dock - kayak included. Being sold with the designer decor and furnishings. Enjoy all the pleasures of watersports and the beach. This stunning home offers leisure living at it's finest.